Revelation has always been a book we understandably hesitate to study, considering that the book was “signified” (Rev. 1:1), i.e., written in symbolic language that is difficult to understand and of which are many interpretations vastly different from each other. However, interpretation of Revelation might be less difficult than we think. After all, we are told to “speak the truth” (Eph. 4:15; cf. John 17:17) and “preach the word” (2 Tim. 4:2). So when we seek to understand Revelation so that we can teach it to others, we must go first to the rest of Scripture to find the meanings behind the symbolism. Keeping this in mind when we study John’s epistle from Patmos will help us see the many parallels between the physical events and people of the Old Testament and the spiritual truths presented in Revelation (cf. Heb. 8:1-5; 10:1; Rom. 5:14; Col. 2:16-17), and will lead us to a scriptural and logical explanation of its symbols. We mustn’t forget that Revelation is Scripture “breathed out by God” which is “profitable for teaching…and for training in righteousness” so that we “may be competent, equipped for every good work” (2 Tim. 3:16-17). It is included among “all things that pertain to life and godliness” which God’s “divine power” has given to us (2 Pet. 1:3). Thus, we need to study this great book in order to truly become what God would have us to be and to receive the comfort and encouragement from God we need during the trials of life (2 Cor. 1:3-5). There is hardly any place in Revelation where this fact is more evident to me than in chapters 4-5, chapters I regularly peruse when I need encouragement and strength during the difficult times. I have always wished that I could have been with the apostle John when he saw “a door standing open in heaven” and heard the voice “like a trumpet” telling him, “Come up here, and I will show you what must take place after this” (Rev. 4:1). 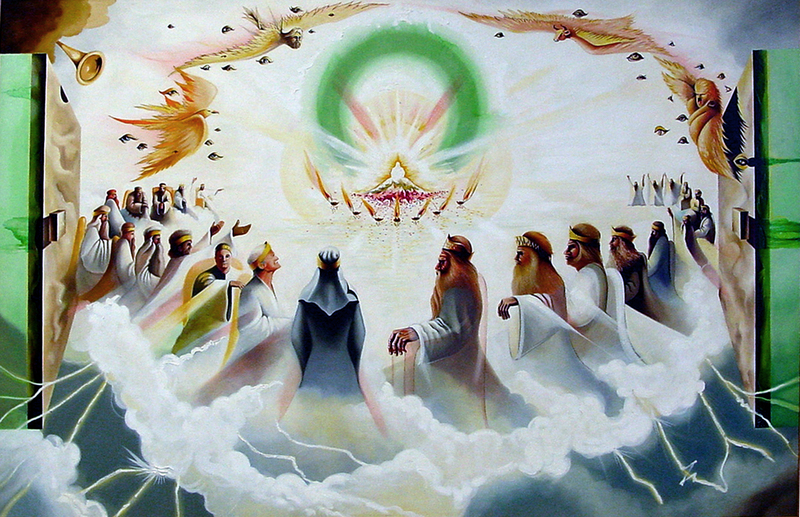 I cannot imagine how it must have been to be “in the Spirit” and witness that magnificent scene in heaven, to have the awesome privilege to see the “one seated on the throne” with “the appearance of jasper and carnelian,” to marvel at the “rainbow that had the appearance of an emerald” that was around the throne (Rev. 4:2-3). Whenever I read of this rainbow, my mind immediately harkens back to how a rainbow was a sign between God and man that he would never destroy all of mankind with water again (Gen. 9:12-17). Its emerald color reminds me of spiritual life, especially when I see in nature how plants that are living and thriving are green and remember how Scripture at times uses the symbolism of plant life to describe people (Is. 40:6-8; Judg. 9:7-15; cf. Rev. 9:4). So when I read of the emerald rainbow surrounding God’s throne, I am filled with comfort because I remember his covenant with me, that he is always with his faithful followers who have spiritual life (Matt. 28:18-20) and will cause everything to “work together for good” for those who love him (Rom. 8:28; cf. John 14:15). The “twenty-four elders” who are seated on the “twenty-four thrones” around God’s throne (Rev. 4:4) also remind me of the covenants God has made with man, specifically the old covenant made with the twelve tribes of Israel (Deut. 5:1-2) and the new covenant taught by the Spirit-inspired twelve apostles (Acts 2:42; Eph. 3:3-5). The crowns on their heads remind me of the authority these covenants have in the lives of those under them (cf. Matt. 28:18), and when they fall down before God’s throne and cast their crowns before him I am reminded that the authority found in the old and new covenants comes from God (Rev. 4:10; cf. 1 Cor. 14:37). Their white robes remind me of how obedience to the laws of these covenants makes one spiritually pure in the sight of God (Is. 1:18; 1 John 1:7-9; cf. Rev. 3:4-5, 18), thus motivating me to continue to strive to not let sin reign in my life (Rom. 6:12-18). The “flashes of lightning, and rumblings, and peals of thunder” coming from the throne no doubt reminded John that he was in the presence of God (Rev. 4:5; cf. Ex. 19:16-20). The “seven Spirits of God” symbolized by the “seven lamps of fire” burning before the throne (Rev. 4:5) remind me first of the Holy Spirit-inspired Word of God (2 Pet. 1:20-21) which is “a lamp to my feet and a light to my path” (Ps. 119:105), as well as a “fire” in my mouth (Jer. 5:14) and “a burning fire shut up in my bones” (Jer. 20:9). The symbolism of the number “seven” also reminds me that God’s Word is “complete” or “perfect” (Rom. 12:2; James. 1:25; cf. 1 Cor. 13:10), just as God saw that his creation was complete and rested on the seventh day (Gen. 2:1-2) and just as our forgiveness of others is to be complete as well (Matt. 18:21-22). Thus, this passage always serves as an motivator for me to continually preach and obey God’s Word in its completeness (Ps. 119:160), because there is never a time in my life when I am not in his presence (Heb. 4:12-13). Reading about the “sea of glass, like crystal” before the throne (Rev. 4:6) reminds me that Scripture at times uses the symbolism of “the sea” to describe multitudes of people (Rev. 17:1, 15; cf. Is. 60:5). When I think of pure crystal that is completely transparent with no spots or discolorations, I remember that faithful Christians also are without blemish in the sight of God (Eph. 5:27; 1 John 1:7-9; Is. 1:18). Therefore, this passage always encourages me that I am not alone, that I am joined with multitudes of other Christians who stand before God’s throne serving him faithfully and receiving his forgiveness and protection (Rev. 7:14-15; cf. Heb. 4:15-16). John also saw “four living creatures” (Rev. 4:6). The first one was “like a lion,” the second “like an ox,” the third “with the face of a man,” and the fourth “like an eagle in flight” (Rev. 4:7). Reading that there are “four” of them brings to mind how Scripture at times uses this same number as a metaphor to describe the entirety of our physical planet (Is. 11:12; Jer. 49:36). Associating these “four living creatures” with the physical planet makes even more sense when I am reminded of how their descriptions in verse 7 correspond with the fourfold division of physical life on this planet described at the creation (Gen. 1:21-26), with the “lion” representing wild animal life, the “ox” representing domestic animal life, the “man” representing human life, and the “eagle” representing winged creature life. John saw these “four living creatures” surrounding God’s throne (Rev. 4:6), and observed that “day and night they never cease” to proclaim the holiness of God and give to him “glory and honor and thanks” (Rev. 4:8-9). When I read of their worship and associate them with the physical life seen in the nature of this planet, I cannot help but be reminded of how the Bible teaches of how animals and nature give praise to God (Ps. 69:34; 148:4-10). John then saw that “the twenty-four elders” joined with “the four living creatures” in offering worship to “him who lives forever and ever” and ascribing “glory and honor and power” to him because he “created all things” (Rev. 4:9-11). When I read this, I am reminded not only of the association of “the four living creatures” with the physical creation of God but also of the correlation between “the twenty-four elders” and the spiritual laws of God given to man via the twelve tribes of Israel in the old covenant and the twelve apostles in the new covenant. This helps me remember that everything – both physical and spiritual – is created by God and exist to please him (Col. 1:16-17). He created everything, and that’s why he is worthy to receive all “glory, honor, and power.” The original readers of Revelation who were surrounded by the idolatrous worship of Roman emperors would have been reminded by this passage that Jehovah is supreme, and two thousand years later I am reminded of the same. Thus, I am encouraged to always give God the glory in all aspects of my life, both physically and spiritually (Matt. 6:33; John 4:24). I am always edified when I read of the “scroll written within and on the back” in “the right hand of him who was seated on the throne” (Rev. 5:1) and how the only One able and worthy to open it would be the “Lamb of God,” Jesus Christ (Rev. 5:6-7; cf. John 1:29; 1 Pet. 1:18-19; Is. 53:7). The fact that the scroll is in “the right hand” of God tells me of its importance (cf. Heb. 1:3; Matt. 25:34). Reading that it was “sealed with seven seals” tells me that its contents are complete, because other places in Scripture use the number “seven” to describe how God looks at certain things in a complete way (Prov. 30:15, 18, 21, 29; Ps. 12:6). No one “in heaven or on earth or under the earth” could open the scroll or look into it (Rev. 5:2-3)…except Christ (Rev. 5:9). When I read this, I am reminded of how much I need Jesus and how much I owe him (Rom. 5:6-11). This is especially brought home to me when I read of how John wept loudly when it seemed no one would be able to open the scroll (Rev. 4:4). It would later be revealed that the contents of the scroll reveal a description of the Christian age (Rev. 6-8; cf. 1 Cor. 10:11), the time when all men would be able to finally obtain redemption (Rev. 5:9; cf. Heb. 9:15; 10:1-4). This sheds light into why John cried, because it appeared at this point in the vision that Satan would win and man would be lost. However, he was comforted by one of the elders, who informed him that “the Lion of the tribe of Judah, the Root of David, has conquered, so that he can open the scroll…” (Rev. 5:5; cf. Gen. 49:9-10; Is. 11:1-2; John 1:32-33; Luke 4:16-21; 1 Sam. 16:19; Matt. 28:18). John then saw Jesus, “a Lamb standing, as though it had been slain.” He stood among the elders between God’s throne and “the four living creatures” (Rev. 5:6), which immediately reminds me of how Christ is at the right hand of God (Heb. 1:3), making intercession for us (1 Tim. 2:5; Heb. 7:25). John described him as having “seven horns and seven eyes, which are the seven Spirits of God sent out into all the earth” (Rev. 5:6), which immediately brings to mind how the Holy Spirit-inspired Word of God is described as all-knowing (Heb. 4:12-13; cf. John 1:1, 14). The Lamb took the scroll from the right hand of God, causing “the four living creatures and the twenty-four elders” to fall down before him (Rev. 5:6-7). Each of them are described as “holding a harp, and golden bowls full of incense, which are the prayers of the saints” (Rev. 5:7). When I read this and see how the harps are later correlated with the worship of God in song (Rev. 14:2-3), I am reminded that my Lord deserves my worship of him in prayer and song because he saved me on that cross (Rev. 5:9) and made me part of his kingdom and priesthood (Rev. 5:10). After reading Rev. 4-5 with the rest of Scripture as my primary guide to interpreting its symbolism, I am always encouraged, corrected, and reminded of all that my Lord has done for me. May John’s testimony of what he saw in that open door of heaven continue to remind us all of what our Savior has done for us, and what we must do for him!